Don't miss this deal on a great room! Book 4 days before Dec. 24th and the 5th day is free! Reserve now! Starting at $279 per person! The Ultimate Moosehead winter get-away! Kin to our popular Ultimate Summer Getaway, this exiting package includes 2 nights and your choice of 2 activities (extended trips available). from you heated fishing hut. 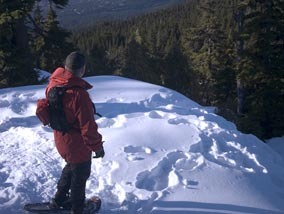 Or perhaps you prefer to quietly track moose and other critters on your snowshoes. All trails start at the Moose Mountain Inn. Good for all ability levels no experience is required. Check out our snowmobile FAQ Page for snowmobile rental details. This year can focus on enjoying your Maine winter experience without breaking the bank! Need equipment rentals? We've got you covered. Guided Ice fishing trip (up to 8 hours add $49.99pp). Most trips last approximately 4 hours, Ice fishing is up to 8 hrs. Get the best of both worlds! Explore and enjoy the hidden Jewel of the Northeast - the Moosehead Lake region - by snowmobile and stay at the Moose Mountain Inn. Enjoy the ultimate in convenience: book your Stay & Play Package, then arrive to find your room(s) and your snowmobile(s) ready and waiting. The Moosehead Lake region has some of the best trails and most beautiful views and vistas in all of New England. Our trail system is immense and with over 12,000 miles of groomed snowmobile trails in Maine alone! The Moosehead Lake region is located in the heart of the snow belt of the Maine Mountains and receives over 100 inches of new snow per year. Prices are per person, based on at least 2 people per room. Package includes a one-person ski-doo MXZ 550. Additional Options include- 2-person snowmobile, available for other snowmobile models, king bed, or add a guide! Call to customize your personal Maine Winter Vacation! Add a guided ice -fishing trip, snowshoe hike, dogsledding trip and more. Cross country skis, snowshoes and warm winter clothing available for rent. 2 nights & 2 days Mid Week Special rental receives a 10% discount! 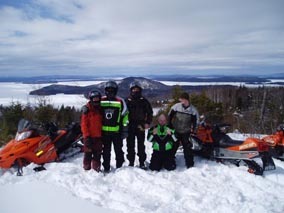 Book a minimum of 2 nights and 2 days snowmobile rentals together and receive a %10 discount! Black out dates February 16-March 4. Room nights are calculated at Standard season rates of $109/nt. Lodging upgrade- add the difference between 109 and king or rental cottage rate. Snowmobile upgrade add price difference 550f single or double and desired sled. If you are just looking for a quick and easy getaway to enjoy the great outdoors this package is for you. 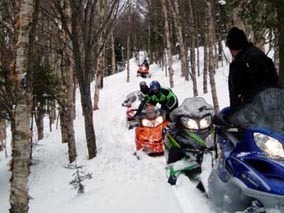 Based double occupancy, you will have a 2-person Ski-Doo Grand Touring snowmobile to cruise the white carpet trail-system surrounding Moosehead Lake. Give us a call to for advice or to customize this package. Generally the best time to ride the trails is during the week. The trails stay better longer and there is much less traffic! We also have better availability and we are able to offer you a better deal. So if you can get away, be sure to take advantage of this great deal! These rates do not include, snowmobile guide fee, tax (7%), insurance, or gratuity (15% customary). 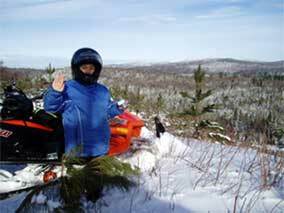 Maine ATV Rental , Moose Tours and Wildlife Safaris, Maine Whitewater Rafting, Maine Snowmobile Rentals.